Tuberous begonias are a garden favorite because of their bright and lovely flowers, in a wide variety of colors and shapes. Since they are small, and shade lovers, they are a great choice for perking up areas around shade trees and larger plants, or planting in areas under eaves. Fill flats with damp peat moss. Roll the tubers in soil sulfur and sink them into the peat moss so that each one is barely covered, with the bumpy concave side up and the rounded bottom down. Place the flats in a warm, shaded spot with early morning sun or in a lath house or gazebo. Keep them damp but don’t fertilize them yet. When growth is 2 or 3 inches high, plant in well-drained acid soil in pots, hanging baskets, or the ground under an eave or noninvasive tree — preferably facing east. Wait until growth is 3 or 4 inches high, then start feeding the plants every time you water; tuberous begonias are big eaters. Use an evenly balanced fertilizer such as 10-10-10, 8-8-8, or 20-20-20. Control mildew with a fungicide; we have many organic and conventional choices. Always allow plants to dry out a little between waterings. Begonias are far more drought resistant than they appear. So, what are you waiting for? 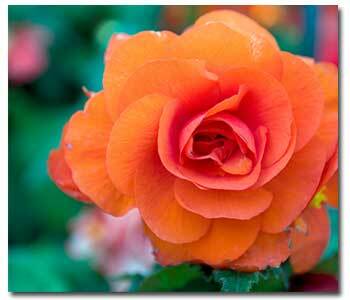 Go plant some Begonias!